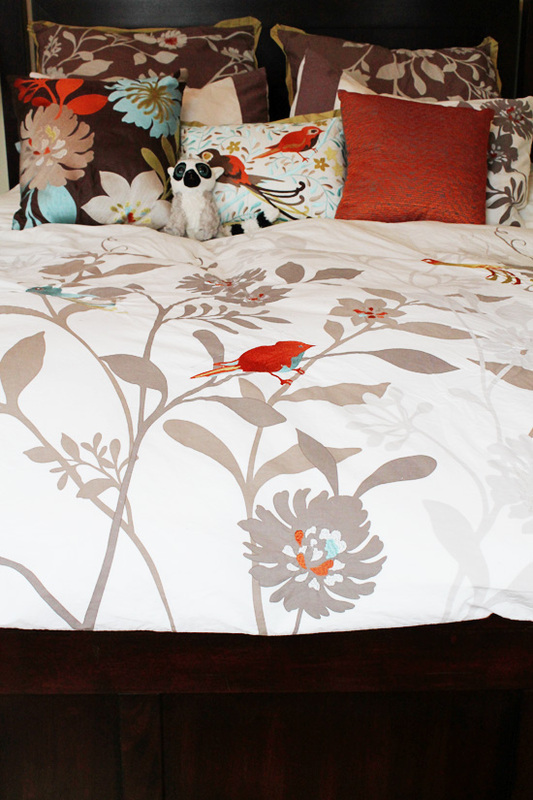 We got a lovely new duvet and pillows for our bed as part of our wedding registry. It was quite a change to the look of our bedroom. We went from dark jewel tones to a bright, cheery and (gasp!) white bedspread. 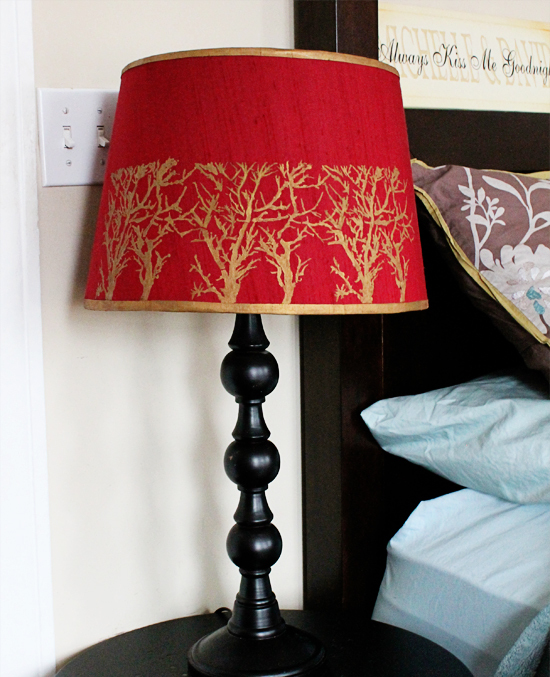 Now, my red and black bedside table lamp doesn't really coordinate. For Christmas, I got this lovely stencil from my mother-in-law. So, instead of buying a whole new lamp, I'm going to update it to coordinate with our new decor. First, tape the stencil to the surface. 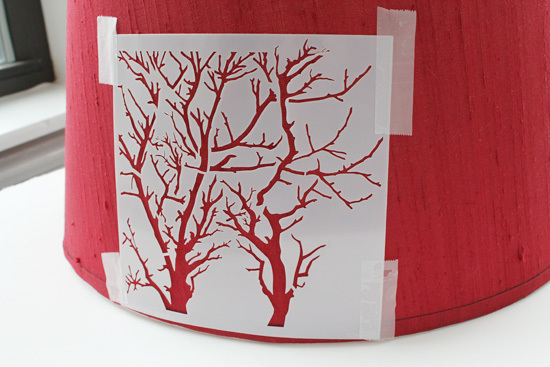 This helps secure it, but you still want to hold the stencil taut during small details. Then paint. I just used a regular ol' acrylic paint. I used gold. Think about how your colors with layer on your surface. First one done. Next, I'm going to go all the way around with the stencil as well as paint the top and bottom edges. But, this lamp isn't done yet! I'm going to paint the base (probably gold) as well as paint these Ikea end tables cream or white. I'll share the finished pics later. The bed looks soooo comfy! Love the patterns. 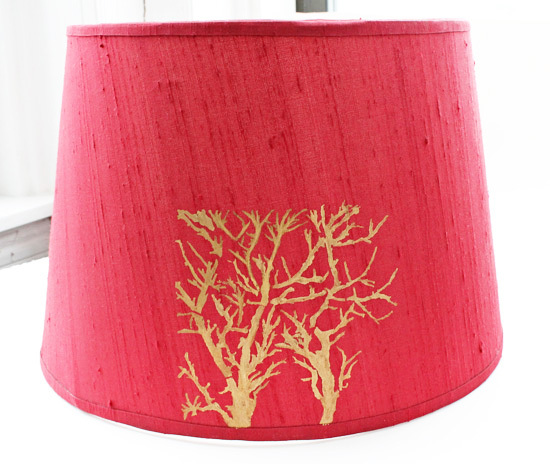 The lampshade looks great, too. It is pretty comfy! At least on top, I don't know about the bottom. I can never find the perfect mattress. This is such a fantastic idea and great color choices! That lamp goes perfect with your bed set. Thank you so much for stopping by my blog - your blog is lovely too! I am now your newest RSS follower as well. So glad to have found you! 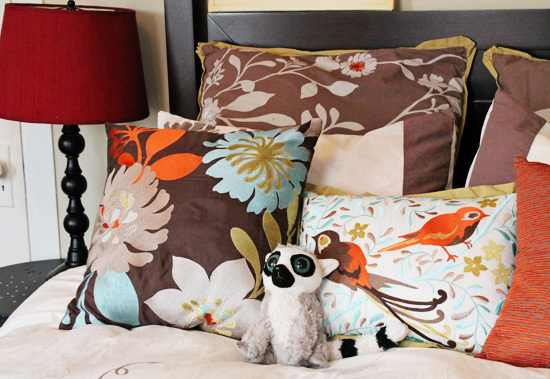 I love your cheery bedding! I can't wait to see how the finished lamp shade looks! Oh, all you creative people are really starting to irritate me! Juuuuust kidding! I love your bedding, and you're too clever to retool the lamp. Great job; it looks beautiful. I love your new bedding. What a great color palette and pattern to wake up to every day. Good on you for reworking the lamps you already have. 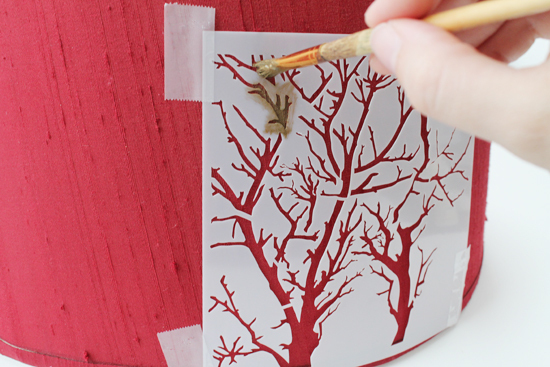 The branch stencil definitely fits you. Love what I see so far...Can't wait to see more. Thanks Theresa! It is pretty cheery for the mornings. Still doesn't make me a morning person though. I found your blog today through Sang the bird's Liebster Award and I'm looking around. Pretty and inspiring blog, I'm sure I will come back! I love DIY too, but the time to do it...have to make time! Thanks Maria! I know what you mean. It's so hard to find that time. Especially to even come up with projects. 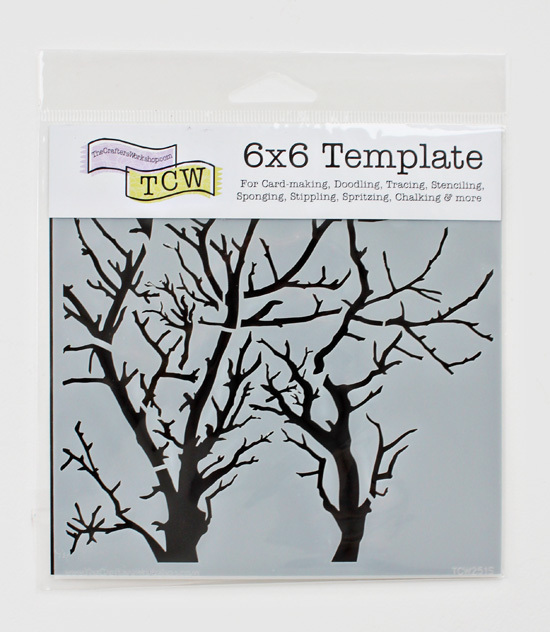 There's so many great and modern templates, they will definitely freshen up any decor. My first craft show - Results!